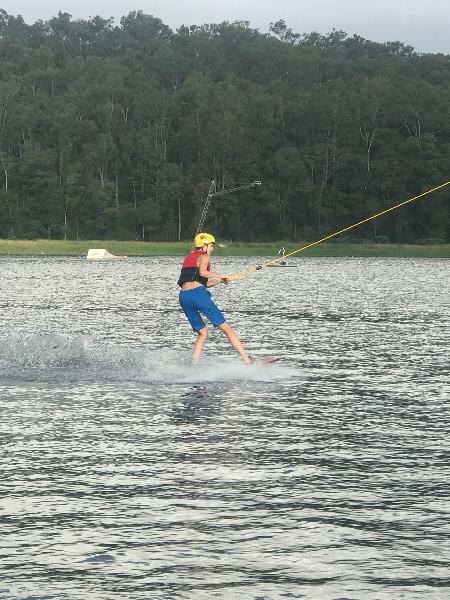 GC Wake Park provides a great day out for beginners who want to give wakeboarding a try to those who are already familiar with kneeboarding, wakeboarding or skiing. Please note this is for First Timers Only. Enjoy Wakeboarding, Kneeboarding or skiing at our world class Wake Park that is the brain child of 3 time world champion wakeboarder, Daniel Watkins. No experience is necessary so it's a perfect day out on the water for beginners, intermediate or advanced riders. We provide the boards and life jackets so you just need to come and enjoy our facilities. Our full size cable takes 8 riders at a time so you can spend more time on the water! We also have a licenced café serving breakfast and lunch to hungry riders and spectators. Enjoy a coffee or a cold beer on our viewing platform, you might even see a World Champion Wakeboarder riding past! We have the best staff in the business who will get you up and gliding through the water in no time. For those with experience we have 8 obstacles in the lake including kickers, sliders and combo boxes to test your skills on. The Gold Coast Wake Park is centrally located in Oxenford, which is approximately 10 minutes from Movie World and 30 minutes from Surfers Paradise. So grab your family or friends, our friendly team are looking forward to welcoming you to the park where we know you will have a great day out! Pass includes basic wakeboard & kneeboard hire & a life jacket. My friend and I went wake boarding here for the first time and we loved it. The service was nice and the staff was friendly. We’ll be back for sure! Found it a fantastic experience. The only things I would have to say is it's not extremely kid friendly for little ones if you want to bring the whole family. The baby gate to the kids play section was broken and is very small. There was only three kids in there but you wouldn't want any more or they would be stepping on each other. Also for first timers it would have been to have a staff member to show us which life jackets to use and how to know which board to use and how to tighten just some direction for new comers who have no experience. Thanks. Heaps of fun with an amazing team ! Had such a fine time and the whole team is absolutely great ! They keep helping you and giving you tips until you stand up and make a whole round and it makes them happy too to see your improvements. Honestly had such a great day :) thanks guys ! Fantastic facility and staff where incredibly helpful! Will be returning very soon! Your message has been sent to Gold Coast Wake Park - 2 hour Wakeboarding or Kneeboarding. You should hear from them shortly. Please note: all responses will come directly from Gold Coast Wake Park - 2 hour Wakeboarding or Kneeboarding, and not the team at Bookme.